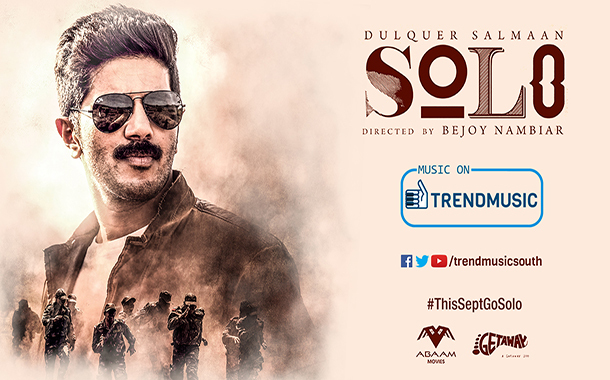 Chennai: Trend Music has once again bagged one of the most awaited albums, Solo. After acquiring hitsproperties like Kadamban, ChandiVeeran, Dharmadurai, Strawberry and Vizhithiru just to name a few; you can now catch the upbeat music from Solo in Tamil and Malayalam. Following the enthralling teaser, the filmmakers uncovered four songs on Tuesday. From the looks of it, these musical numbers belong to the story of Rudra starring India’s heartthrob Dulquer Salman who plays a zealous lover with a rebellious attitude and head over heels about Akshara played by Neha Sharma. The film is directed by BejoyNambiarwho’s known for making history by creating hits like Pizza, David and Shaitan. He’s currently all geared up to deliver an exquisite cinematic experience that’s going to sooth all your senses.Songs from Dulquer’s recent blockbusters like OK Kanmani and Bangalore days were huge hits. “We’ve always prided ourselves on quality acquisitions and Solo is definitely a testament to that! Solo is the kind of album that will make waves in both consumer trends as well as how producers and music directors approach the entire life cycle of an album. This couldn’t have been possible without the massive support and love the industry is constantly showing us and as always, we hope to take our tracks to the next level!” says Chidambaram Natesan, CEO of TrendMusic. Roshomon is a fast paced song with upbeat music and lyrics, which is the background score in the teaser. It’s composed by PrashantPillai who has worked with Bejoy earlier in David whichwas hit too. Bejoy roped in some young music bands like Filter Coffee and Masala Coffee who delivered an exceptional output alongside the well-known composerSoorajKurup whocomposed the music for other songs that instantly strike a chord with a fusion of traditional and contemporary music that’ll leave you hearing them on loop. The songs so far are versatile and one of a kind. Bejoy has worked with 11 composers to make sure the album elevated the aura of Dulquer’s character, Rudra. He revealed earlier that Dulquer would be playing different characters that revolve around four elements: earth, fire, wind and water. The makers of the film are busy planning for a concert in Kochi for their loyal and passionate fans. Get ready to watch Solo that’s all set to release this September.